Milwaukee<sup></sup> M12 Realtree Max-1<sup></sup> Camo Heated Hoodie: A versatile heated solution for the outdoorsman, the M12 Cordless Realtree Max-1<sup></sup> Heated Hoodie integrates (3) carbon fiber heating elements between a durable water repellant exterior and waffle-weave thermal liner to distribute and maintain heat across core body areas. An adjustable heat zone that spans the chest and back provides the right amount of heat for any season. In fall and spring months, the M12 Camo Heated Hoodie can be worn as a rugged piece of outerwear. In the harshest winter conditions, it works best as a solitary base layer that allows users to shed bulky undergarments while generating and holding heat close to the body. Featuring special noise-reducing fabric and the Realtree Max-1<sup></sup> Camo pattern, the hoodie provides up to 6 hours of continuous heat per battery charge while utilizing the same M12 REDLITHIUM Battery technology that powers 60+ tools. All M12 Heated Hoodies are washer and dryer safe. Designed for the Woods: Noise reducing fabric with Realtree Max-1<sup>®</sup> Camo pattern to blend in with natural colors of prairie grasses, brush, sage and rocky desert terrain. 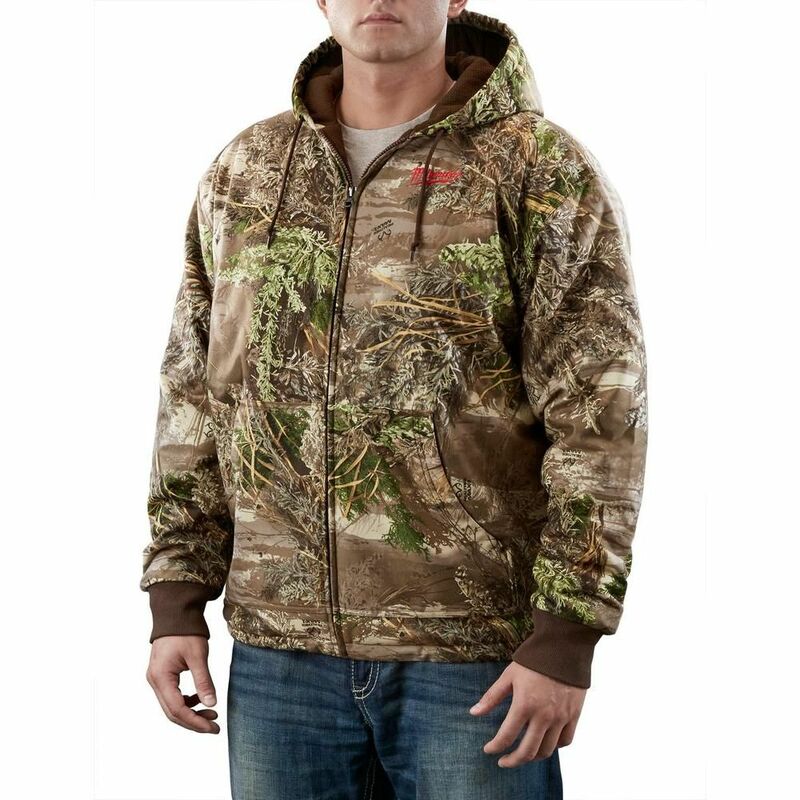 M12 Cordless Realtree Max-1 Camo Heated Hoodie Only - M Milwaukee<sup></sup> M12 Realtree Max-1<sup></sup> Camo Heated Hoodie: A versatile heated solution for the outdoorsman, the M12 Cordless Realtree Max-1<sup></sup> Heated Hoodie integrates (3) carbon fiber heating elements between a durable water repellant exterior and waffle-weave thermal liner to distribute and maintain heat across core body areas. An adjustable heat zone that spans the chest and back provides the right amount of heat for any season. In fall and spring months, the M12 Camo Heated Hoodie can be worn as a rugged piece of outerwear. In the harshest winter conditions, it works best as a solitary base layer that allows users to shed bulky undergarments while generating and holding heat close to the body. Featuring special noise-reducing fabric and the Realtree Max-1<sup></sup> Camo pattern, the hoodie provides up to 6 hours of continuous heat per battery charge while utilizing the same M12 REDLITHIUM Battery technology that powers 60+ tools. All M12 Heated Hoodies are washer and dryer safe.